You've seen just a glimpse of the Urban FX line on Facebook page and in the post on NAMTA, so here now are all the delicious details on this cool, completely unique line of brushes, not available from anyone else. The new Urban FX line is a combination of two types of brushes. One uses natural white bristle, in flat, oval, and angular shapes in 3 sizes, small, medium and large. These have a chiseled edge which can paint a precise sharp line or lay paint down flat on the wide edge. The other type of brush tuft is a honey brown nylon, with traditional as well as unique shapes for the adventurous painter. Many of these have national and international patents on the shapes. All the brushes feature brightly colored handles, offering proper balance and feel. Additionally, the handles are coated with our soft touch, non-slip lacquer, to insure ease of handling in all environmental conditions. 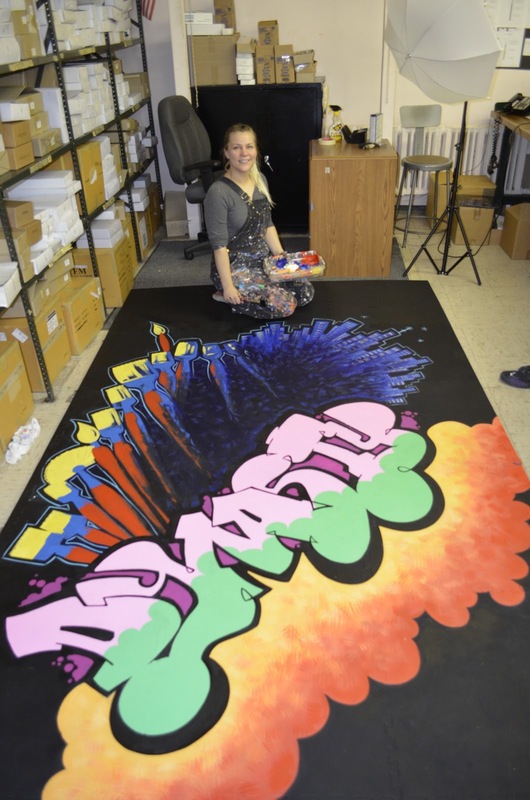 Muralist and scenic artist, Brittany Ruhnke spent two weeks in our factory in Glendale designing and painting our new floor. Brit began her work with the FX Bristle brushes, white bristle in seamless black ferrule. Perfect for scrubbing into textured surfaces. Brittany created the detail and motion with the FX synthetic brushes. These brushes are ideal for outdoor murals, faux finishing, furniture work and scenic art. In particular the white bristle brushes work well on rougher terrain like tile or stone. The nylon brushes are softer and would be better on wood, glass or metal. These brushes would work best with latex, acrylic or enamel type paints, even oils or alkyds. Make sure you clean them well after each use, however, to prolong their life. I will keep you updated on when and where these will be available but right now it looks like they will be shipping in July.